The LifeSpan Fitness TR1200i Folding Treadmill (2018-2019) is a medium duty treadmill. It is ideal for walking/jogging for weight loss or cardio workouts. Built in heart monitor program, allows you keep your heart rate constant as the treadmill adjusts the speed and incline for you. Features include a strong 2.5 horsepower (hp) motor (continuous duty) , which can reach speeds up to 11 miles per hour (in increments of 0.5 mph). 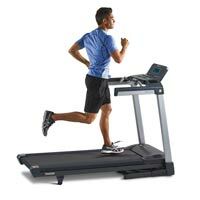 The TR1200i treadmill can incline between 0 (flat) to a 15 percent grade. The deck is a 20″ x 56″ area for walking, and jogging. Ideal for toning up, managing your weight, and improving your cardiovascular health. The deck suspension system supports people up to 300 pounds in weight. 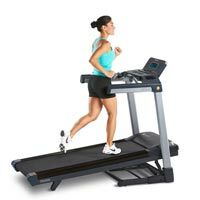 The TR1200i treadmill includes a folding frame with an automatic EZ Drop system. Intelli-Step step-counting feature that works like a pedometer. Log your progress to a USB device. You automatically receive a membership to the LifeSpan Fitness Club. This online health management program, lets you select exercise programs and track and manage your fitness and health results. TR1200i Advanced Features: Features include a backlit LCD screen (tracks your time, calories, distance, heart rate, steps, speed, and incline). Pulse grip heart rate monitoring, and 21 workout programs. Quick-start speed and incline buttons. Built-in speakers and headphone port. 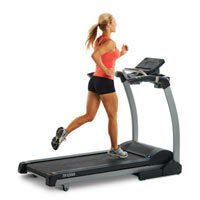 Treadmill Warranty: Frame & Motor – Lifetime; Parts – 3 years; Labor – 1 year. Smart-Review Commentary: The Folding LifeSpan TR1200i is a highly rated treadmill (Both professional and owner reviews). Its EZ Drop system makes it easy to fold up when not in use. With a large 20 x 56″ running area, it is ideal for walking, or jogging. You can set the treadmill to keep your heart rate constant (treadmill will adjust to keep it in the zone). Its LCD display is clear and easy to read. The built in speakers allow you to plug in your mp3 player and listen to music as you exercise. You can record your progress to a USB device to review later on your computer with the LifeSpan Fitness Club (included with purchase). The two-ply belt on the TR1200i is more durable than those on cheap treadmills. The Handlebars are over-sized and easy to grip, and include buttons to safely and conveniently adjust your speed and incline. 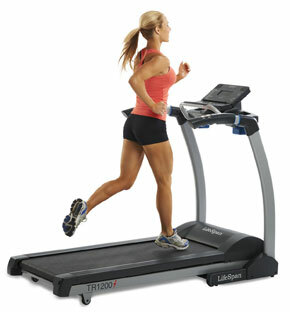 Reviewers report that this treadmill runs quiet and smooth. 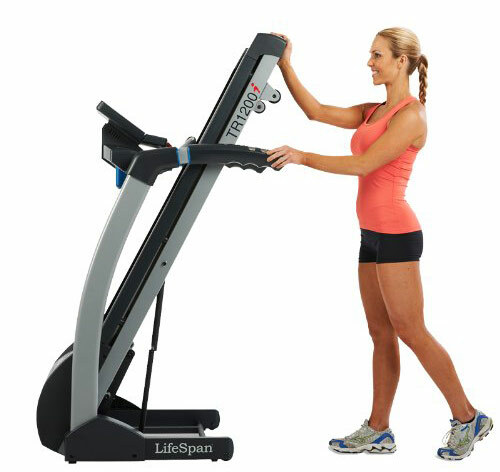 We have found that overall the LifeSpan Fitness brand of treadmills have received excellent reviews. This is one of our top models in this price range. The TR1200i is a great value with a lifetime motor & frame warranty, and loaded with programs and features usually seen on more expensive models. This model is not only a Smart-Review Top Pick, but also received our Best of 2018 award for treadmills in the under $1000 category.